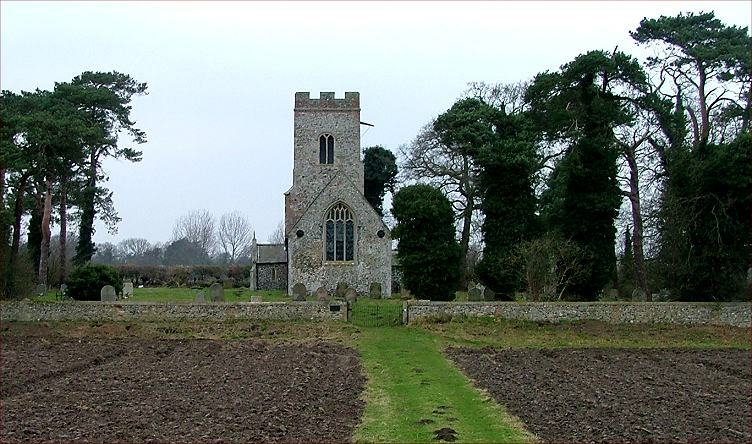 This area between Norwich, Beccles and Diss has the greatest concentration of medieval churches in western Europe, and yet some of them still seem to be so remote. Take St Peter - there is no village, there are no houses around. There is no road - to get to the church you have to walk along a grass path between ploughed fields. Cedars flank the graveyard, probably the work of some 19th century Rectory with an arboreal interest. St Peter is nothing special beyond the fact that it is special in itself. Little details there are, of course - the stone royal arms, the 19th century organ case painted with angel musicians, the screen with large parts of its 14th century tracery intact (Pevsner missed this, but Cautley didn't) and best of all a sad little slate memorial in the wall to five children of the Sallett family who now shine with Saints; they heare the angells sing and follow the lambe in their white attire. You can read it all below. It is undated, but the puritan sentiments and style of the memorial place it in the mid-17th century. One of the lovely things about St Peter is that it is always open - but if you are worried about little things being stolen, then you are too late. It is all been taken, there's nothing left to steal. A notice in the porch details everything that has gone, all that you missed. Everything left is firmly bolted down, and so the little building stays open as an act of witness. I think it is even more than that - here is a place where generations of pilgrims and strangers have been able to stop for a while, an ancient space in which to rest. A little bit of England that still belongs to everybody. If the authorities start locking places like St Peter then it will be the end, and there won't be any point in celebrating such lovely, ordinary churches.